On arrival in Kunming ,you will be met & transferred by our professional English speaking guide to your hotel. Enjoy the rest of the day at your leisure. Buffet breakfast at hotel. Full day tour to Stone Forest, Seven Star Yi people’s village.Lunch with famous local roast duck. 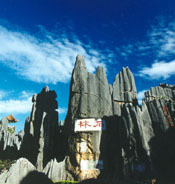 Stone Forest: Known as "First Wonder of the World", one of the most important attractions of Yunnan. Buffet breakfast at hotel, then transfer to the airport for flight to Dali by morning flight. Upon arrival, visit the Erhai Lake, Three Pagodas of Chongshen Monastery and Dali old town. Erhai Lake: the largest highland lake next to Dianchi and one of the seven biggest fresh water lakes in China. Dali old town: built in 1382 and is one the 24 most famous historical and cultural cities in China. Three Pagodas of Chongshen Monastery: It is a symbol of the history of Dali City and has a history of over 1800 years. In the morning, drive to Xizhou, taste the famous Three Flavours of Tea (Sandao Tea) and visit the local Bazaar, then enjoy the beautiful rural scenery by HORSE carriage. Lunch at the local Bai's family. Drive to Lijiang in the afternoon. Upon arrival, visit Wanggu Building to get a bird's view of the whole Ancient City of Lijiang. Ancient City of Lijiang (Dayan Ancient Town): The town is a largely Naxi settlement first built during the Southern Song Dynasty and was listed by the UNESCO on the list of the world’s major cultural heritages in 1997. Buffet breakfast at hotel. Visit Suhe Naxi people’s village, Baisha Murals in Baisha Naxi village and Black Dragon Pool. Black Dragon Pool: The pool is listed in the Collections of Famous Pools in China because of its beauty. Buffet breakfast at hotel . Free until transfer to the airport for flight to the next destination.